There's a lot still on the table for the West Linn girls basketball team. A shot at a Three Rivers League title. A chance to host two playoff games and return to the Class 6A state tournament. With all that hanging in the balance, the Lions got after it hard in their Tuesday home game against Canby, racing out to a 17-point lead in the first quarter and rolling on to win 75-51 at West Linn High School. "It was pretty good," said West Linn sophomore guard Peyton Shelstad, who finished with 15 points on 6 of 14 shooting from the field (with three 3-pointers), along with four rebounds, four steals and three assists. "I thought we played really hard with a lot of energy the whole time." 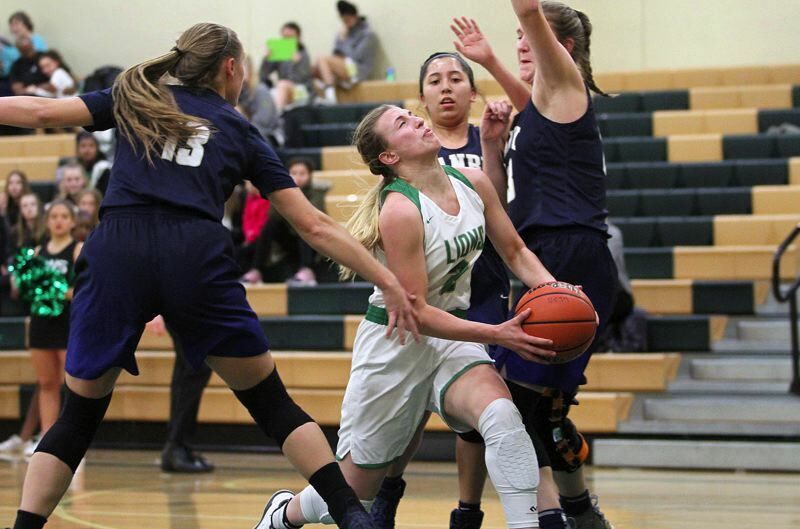 "We really used our versatility this game," said West Linn sophomore guard Audrey Roden, who added 13 points on 4 of 7 shooting from the floor (including two "3s") and 3 of 4 foul shots, along with four rebounds, four assists and three steals. "The last time we played them, we didn't have (sophomore post Aaronette Vonleh), but we did really good getting her back into it against this team." With the win — the team's eighth in its past nine game — No. 5 West Linn improved to 9-2 and a second-place tie with Oregon City in the TRL and 16-5 overall. No. 33 Canby, meanwhile, lost for the second straight time and fell to 4-7 in league and 8-14 overall. "I feel like we really played as hard as we could and we had a really good game," said Canby junior post Nicole Mickelson, who grabbed three rebounds and made two assists in the loss. "There were just some letdowns and we let the refs get to us a little bit, but other than that, I thought we did really good." "I thought we did pretty good," agreed Canby junior post Ally Odell, who led all scorers with 19 points on 8 of 15 shooting from the floor (with three 3-pointers) and added three rebounds. "Obviously, some of those plays weren't going to work out but we tried really hard and executed most of the time." The Lions came out hot on Tuesday, grabbing an early 10-2 lead when Elisabeth Dombrow took a pass from Cami Fulcher and buried a 3-pointer from the left wing two minutes into the game. The Cougars got two straight baskets from Odell to close within 10-6 points, but saw the Lions close the frame on a 15-2 run highlighted by five Vonleh points, four more from Fulcher and 3-pointers by both Dombrow and Roden to lead 25-8. Canby, however, responded with its best stretch of the game, outscoring the Lions 15-7 over the first 4:30 of the second quarter to close within 32-23 when Odell took a pass from Naarai Gomez and scored inside with 3:30 left in the half. During that run, Odell hit two "3s" and scored eight points, Gomez kicked in four points and Joey Baguio added another 3-pointer for the Cougars. The Lions, getting five points from both Dombrow and Vonleh in the second quarter, pushed their lead back to 41-29 at the half, then put the game away with a dominant 19-3 scoring edge in the third quarter that extended their advantage to 60-34. While the Cougars went just 1 of 12 from the field in the third quarter — that one basket an Odell "3" with eight seconds left in the quarter — and turned the ball over six times, the Lions took off behind Shelstad and Dombrow. Shelstad knocked down 3 of 5 shots from the floor (including one "3") and scored seven points in the third quarter, while Dombrow went 3 of 4 and added six points in the frame. "They were hitting a couple of shots in the first half, but we didn't let that get to us and kept fighting the entire game," Shelstad said. Roden, meanwhile, explained the importance of playing well in the latter stages of the regular season. "Our coaches have been saying 'Why not now? Why not get it going now? Why not take care of business and play our best now because we need that momentum going into the postseason,'" she said. On their end of the court, the Cougars were satisfied with their efforts despite the night's disparate final score. "I feel like we competed really well but … they're a really good team and they were able to pull it off tonight," Mickelson said. Odell, meanwhile, talked about her team's flexibility against the Lions. "Today, people had to step up in new positions," she said. "I had to shoot — that's really not my normal (role) — because Nicole got some fouls and she had to go out. … A bunch of us stepped up into roles we aren't normally comfortable in." For West Linn, Dombrow led the way with 17 points, four rebounds and three steals, and Vonleh added 14 points, six rebounds and two steals. For Canby, Gomez added seven points, five assists, five rebounds and three steals, and Zoe Thompson had six points.